Famous for being one of the Six Fighting Bakugans who stopped the destruction of Vestroia and resurrected New Vestroia, Neo Dragonoid reunites with Dan to battle the Vexos that are enslaving Bakugans. Neo Dragonoid evolved from Drago after defeating Barius and Fly Beetle with a fire tornado. He uses his gigantic wings as a shield against fire, water, and wind. 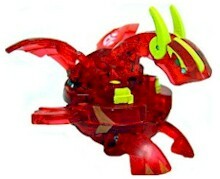 Purchase Neo Dragonoid from Amazon now!